Macro Lens -is a lens that is able to focus much closer then an ordinary lens and has a 1:1 magnification. If that’s not confusing enough Nikon calls their lenses micro and Canon calls theirs macro. Just remember that they a for making close up photographs of small things. Lens Speed – refers to the maximum aperture of a lens. A wider aperture allows more light in, so a faster shutter speed can be used for a proper exposure. A lens which allows for a larger aperture (smaller f-number) is often called fast glass. Prime Lens – a lens with a fixed focal length. Which means only one angle of view, or no zoom function. So you have to zoom with you feet, this means if you want the subject to by larger in the frame then you have to walk closer to them. 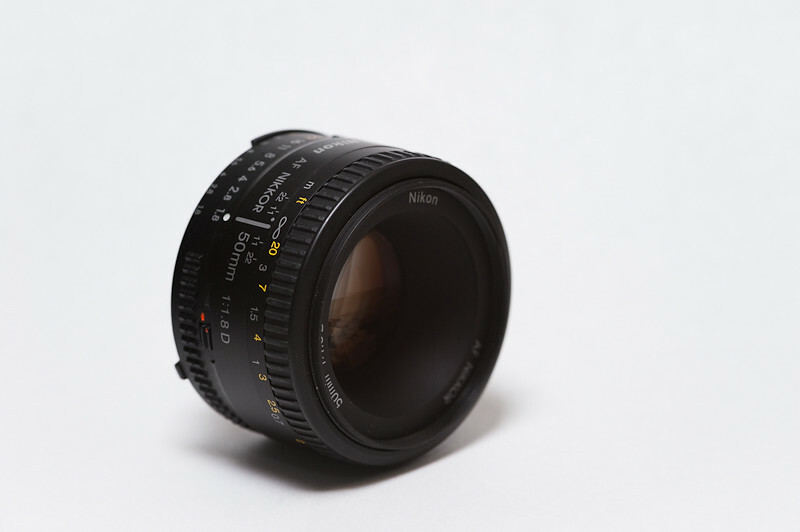 The photographs below is of a Nikkor 50mm f/1.8 prime lens. Prime lenses tend to cost a little less than there zoom lens counter part because there are fewer lens elements in the manufacturing of prime lenses. Prime lenses also come with a larger aperture than zoom lenses. RGB – is a color mode that adds varying amounts of red, green and blue colors to produce the color in an image, so it is know as an additive color mode. When all the colors are added at once it creates white. Common RGB output devices are TVs, computer monitors, LCDs, and cell phones. Printers start with white paper so it is not a RGB device, it uses a subtractive color mode (typically CMYK). JPEG – Joint Photographic Experts Group is the most commonly used image format. It is universally compatible with internet browsers, viewers, and image editing software. JPEG allows images to be compressed by 10 to 20 percent with very little loss of image quality. On a side note, when photographing with a DSLR camera the images viewed on the camera’s LCD is a JPEG image, even if shooting in RAW.